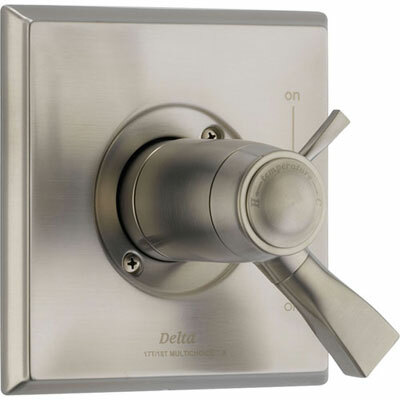 We often get asked questions like: What is the difference between Delta Monitor 17 Series Shower Control Trim Kits and Delta 17T TempAssure Series Shower Control Trim Kits? How does the 17T Thermostatic Shower cartridge compare to the Monitor 17 Series Shower Cartridge? What is the difference between the two? Why is the 17T version more expensive? Although the 17 and 17T part numbers may look similar, the "T" at the end really does make a big difference. 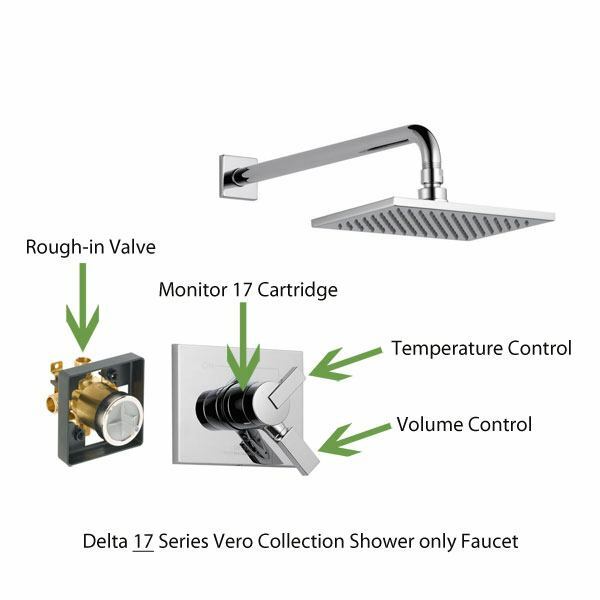 The numbers 17 and 17T represent types of cartridges found in Delta brand shower faucets that have separate volume and temperature control handles. 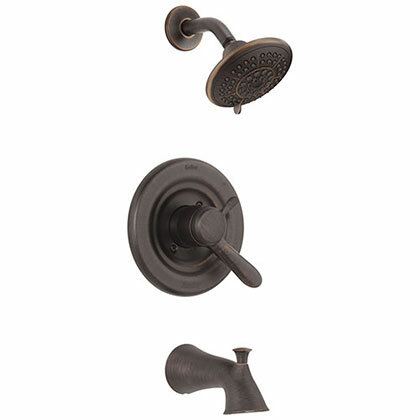 They indicate the exact type of cartridge included with the Shower Trim Kit. If you want to understand a little (or a lot!) 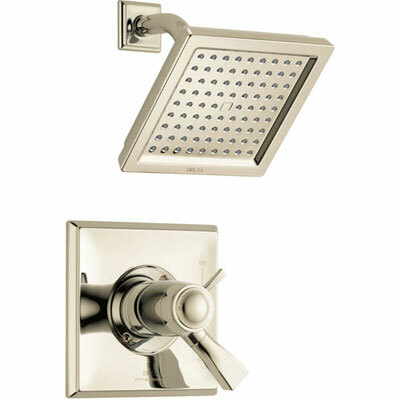 more about comparing Delta dual control shower valve fixture cartridges then read on. Trim Kit: This is the part of the shower you see. 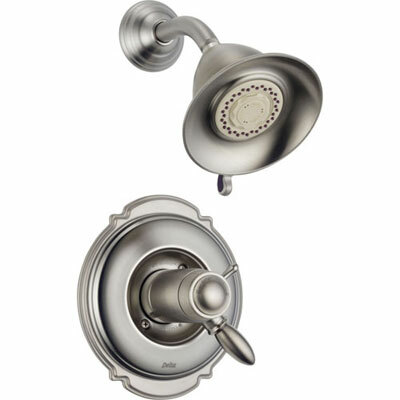 It includes the showerhead, shower control handle, shower arm, shower flange, and escutcheon. 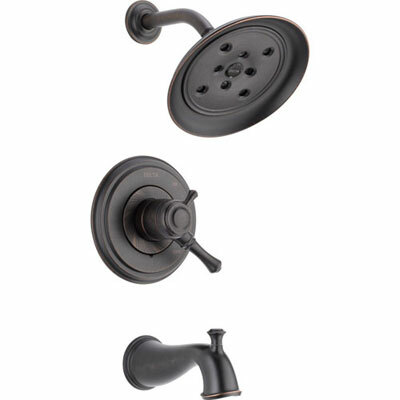 With a tub / shower combination the Trim Kit also includes the tub spout. In Delta showers, the Trim Kit also includes the cartridge. All trim kits require a rough-in valve for installation. 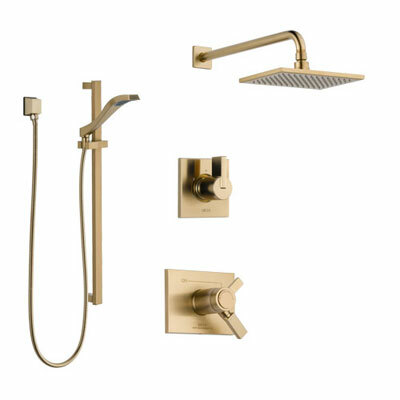 Cartridge: The part of the Trim Kit that sits underneath the shower handle which controls the water flow and temperature. 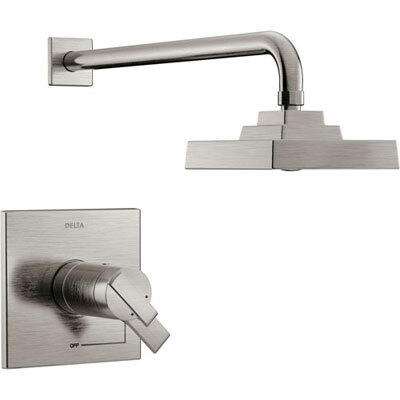 17 Series / 1700 Series / Monitor 17 Series / Monitor 1700 Series: These terms are all used interchangeably and refer to the non-thermostatic, pressure balanced version of the Delta dual control shower cartridge. Monitor is a term Delta uses to refer to their pressure balanced cartridges. 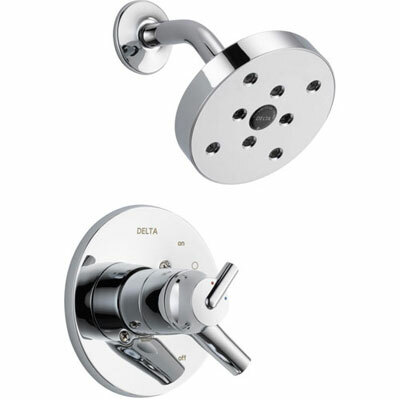 17T / 17T Series / Tempassure 17T / 17T Series TempAssure: Refers to the Delta thermostatic shower dual temperature and pressure control cartridge. 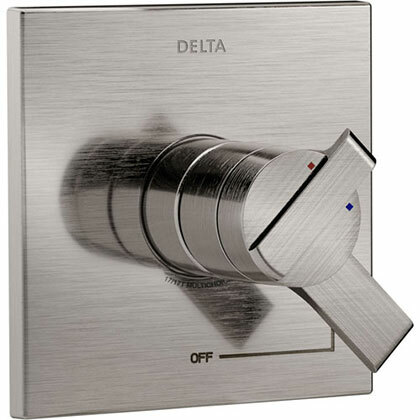 TempAssure is a term that Delta uses to refer to their proprietary thermostatic shower cartridge technology. 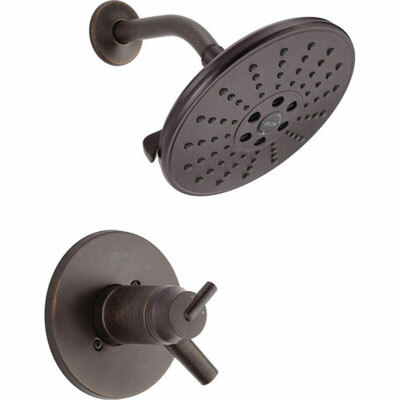 Rough-in Valve / Shower Valve: A required shower part that installs in the wall and hooks up to your home's hot and cold water lines. All rough-in Valves require a Trim Kit. 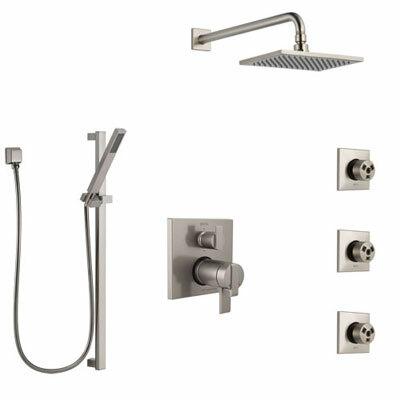 Shower: For simplification, we will use the term shower to refer to Shower only Faucets, Tub and Shower Combination Faucets, Shower Systems, and Shower Controls. 17 and 17T cartridges are found in all of these different types items so the information you read below will be applicable to any Delta Shower Trim Kit. The presence of a tub spout or other variations does alter change the functionality of the cartridge. If you need clarification on any of these terms, check out our Complete Guide to Delta Showers. 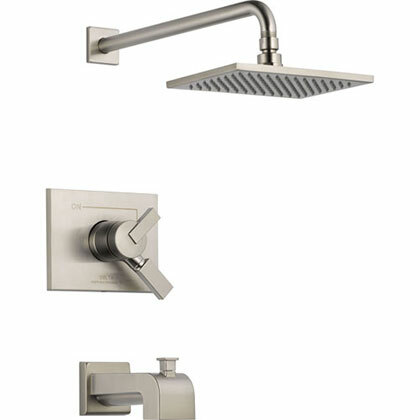 Delta's shower plumbing design is a little different than that of other manufacturers. 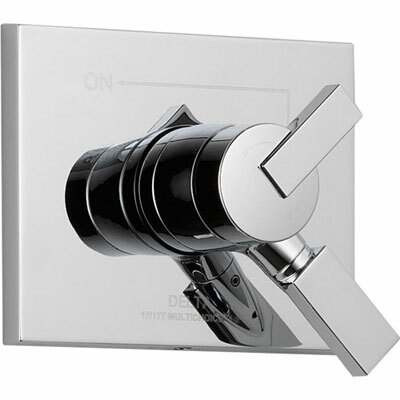 With Delta showers the Cartridge is sold as part of the Trim Kit and NOT as part of the Valve. Delta valves feature universal installation capabilities and are designed to work with any style of cartridge. 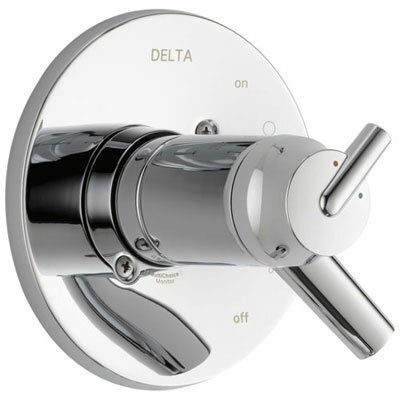 You can fit any Delta standard shower trim kit onto their universal multichoice valve. 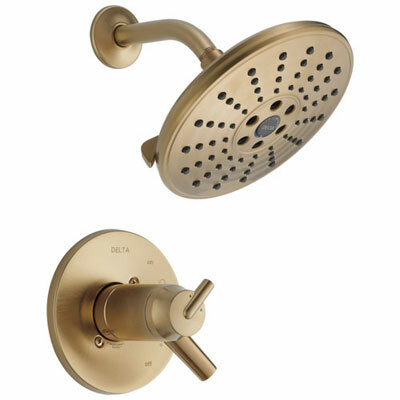 The fact that the cartridge defines the function of the shower rather than the valve means that the trim kit (which includes the cartridge) is the piece you must pay attention to when ordering. 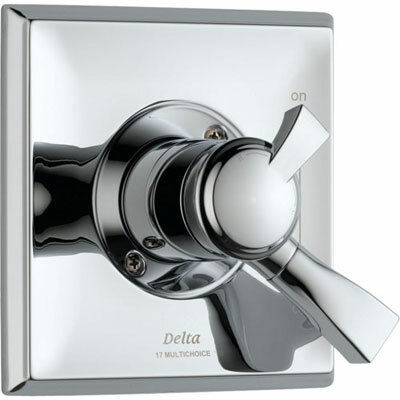 Since Delta fixtures mostly use the same universal multichoice valve, there's not as much you need consider with regards to that fixture (although there are still a few differences). 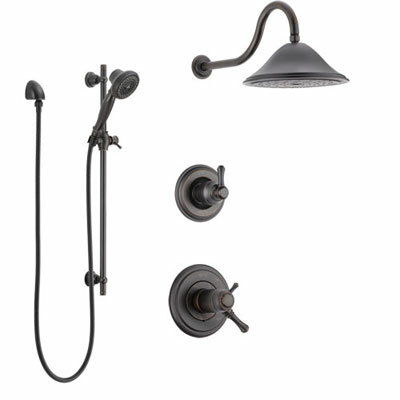 It's the trim kit that is going to define both the style of your shower as well as the function. So what exactly does 17 and 17T refer to? That number is in reference to which cartridge Delta includes with the shower trim kit. 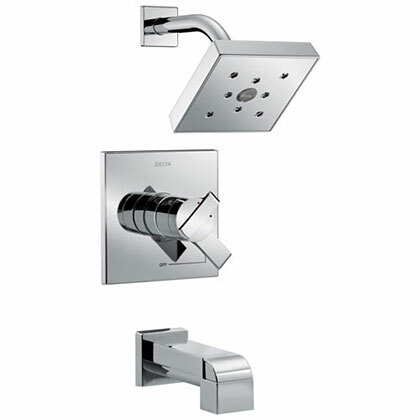 Delta dual control shower valve trim kits are classified as either 17 or 17T depending on which cartridge they contain. We'll explore more about the 3rd type of cartridge (Delta Monitor 14 Series) in another article. For now we are only concerned with the Monitor 17 Series and 17T TempAssure shower cartridges. 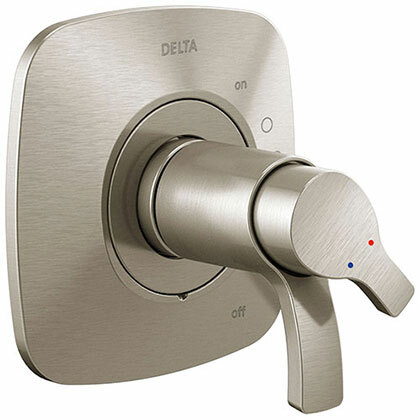 When you are shopping for a Delta Shower only Faucet, Tub / Shower Combination, or Shower Valve Only Control Handle you will find that there few different handle configurations. The 17 and 17T Series trim kits both feature dual control handles which allow you to adjust the water temperature and pressure separately. 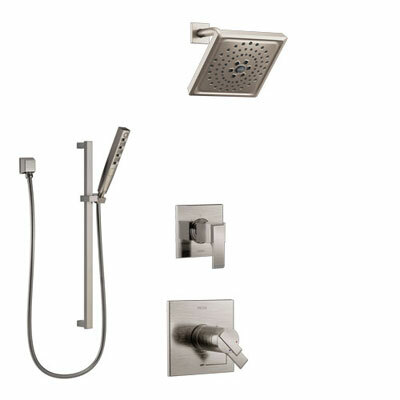 From the user experience perspective, the 17 Series and 17T Series showers ARE THE SAME. 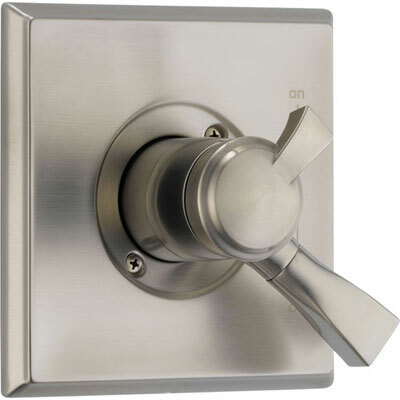 Both have a dual control handle and feature separate volume and temperature levers. If you are wondering how to turn on the shower, it's the same for both. If you are wondering how to adjust the temperature of the water, it's also the same for both! The difference between the 17 and 17T Series has to do with how exactly the changes are achieved internally by the shower valve cartridge. 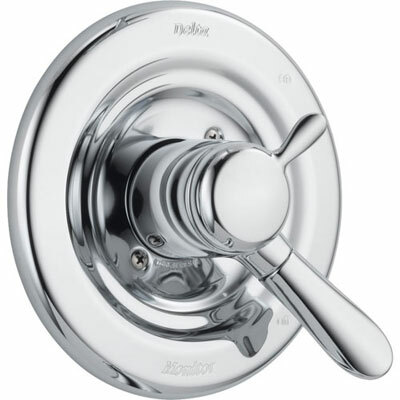 If you look at either a 17 or 17T trim kit shower control you will see that there is a large handle with a smaller dial handle sitting on top. The large handle is used for adjusting the water volume. The small handle is used for setting the temperature. 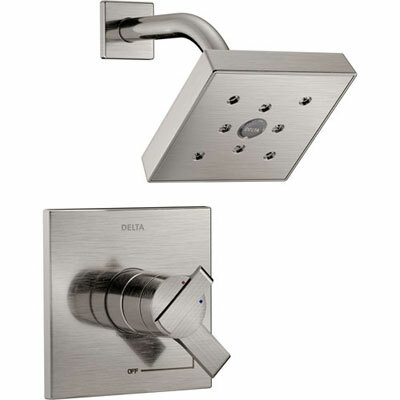 From a style perspective there is only a small difference between the Delta 17 and the 17T showers but with regards to how you use the handles to control the water, there is no difference. 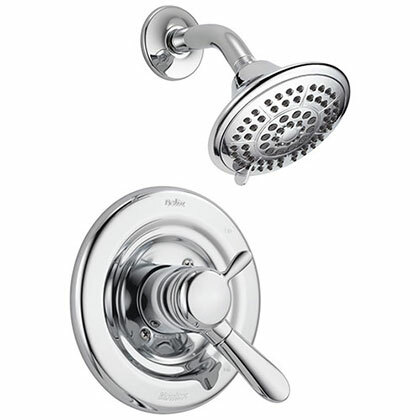 The large Shower faucet handle can be rotated to adjust the amount of water flowing from your showerhead (or tub spout in the case of a tub/shower combo). As you rotate the handle counter-clockwise the water will turn on. The flow rate and water pressure will steadily increase as you continue turning. The small handle is the temperature control. It's actually not necessary to set it and re-set it every time you take a shower. 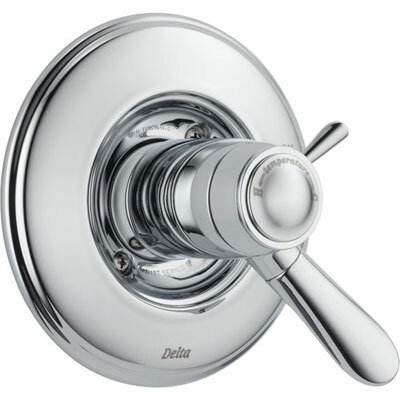 The beauty of a Delta dual control shower faucet is that you can rotate the larger handle to turn on the water without needing to change the position of the smaller temperature lever. This means you can leave the temperature setting in place and the water will also be set to come out at your preferred temperature. It's not necessary adjust it on a daily basis. Of course if different people in your family have different preferences, they can easily use the temperature lever to set their preferred water temperature. 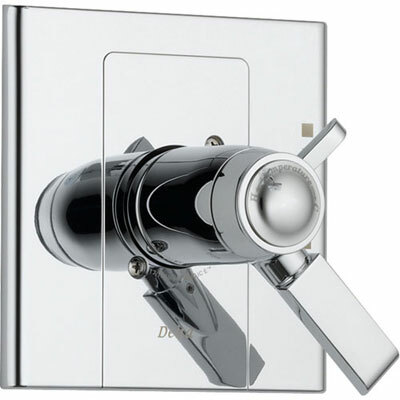 When you see the terms Monitor 17 Series, Monitor 1700 Series, 17T, Tempassure 17T, or similar, you will now understand how the dual shower control handles work. 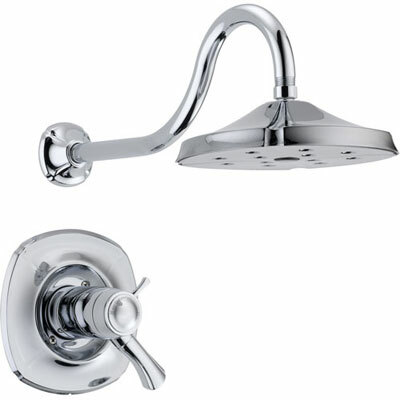 Large handle controls water volume / pressure, small handle sets water temperature. If they both have the same dual controls what exactly makes them different? The Tempassure thermostatic shower 17T cartridge represents a fundamental technological improvement on the Monitor 17 series pressure balanced control function. To understand the advantages it offers you need to understand a bit more about how exactly a shower cartridge works. It might be helpful to re-frame the way you think about a Monitor 17 Series dual function cartridge. It's not so much about controlling the temperature. Instead, it's about controlling the ratio of hot to cold water that comes out of the shower head. Rather than sensing the actual temperature, it senses the pressure differences between the flow of hot and cold water to the shower (hence the term pressure balanced). The problem that causes water temperature fluctuations is pretty basic. When a toilet is flushed, cold water flows into the tank to refill it. This causes the water pressure in the cold water pipes to dip. If this happens when you’re showering, less cold water reaches the shower, and this changes the comfortable warm hot/cold water mix to hot only. If someone turns on a hot water faucet elsewhere in the house, the opposite can occur. The hot water pressure drops and you get a shot of cold. This problem is exacerbated in older plumbing that’s clogged with mineral deposits, in relatively small supply piping, and in showers with low-flow shower heads. Due to the changes in water pressure, the 17 Series pressure balanced shower cartridge detects that there is less either less hot or less cold water currently flowing through the supply pipes and in to the shower valve. To compensate, it slows down the flow rate from the opposing water temperature supply line at a similar rate to maintain the same hot-to-cold ratio. So if the cold water supply drops, the cartridge also lowers the hot water supply by an equal amount. If the hot water supply drops, the cartridge will lower the cold water supply by that same amount. Your shower water will remain the same temperature because of the hot / cold water pressure ratio adjustment performed by the cartridge. 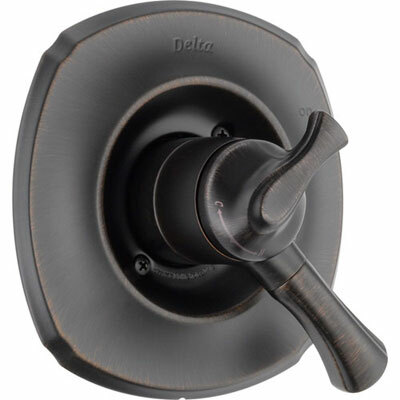 The Delta 17 Series Monitor Shower Cartridge uses a spool-and-sleeve configuration to adjust the water pressure to assure a comfortable shower experience. The spool and sleeve in the Pressure-Balanced Cartridge work together, automatically adjusting the flow of incoming hot and cold water to maintain a consistent temperature based on pressure variances. As an industry leader, Delta is constantly innovating. Because of this they were able to develop a more accurate temperature sensing medium. The technology used in the 17T series cartridge is superior to the 17 Series in this regard. The 17T cartridge works like a thermostat to control the temperature of the water. It uses a wax and spring configuration to measure and monitor the temperature of the water and automatically adjust the hot and cold water mix to maintain a more precise shower water temperature and pressure. The Tempassure 17T series cartridge does a better job keeping the temperature in exactly the range you set. 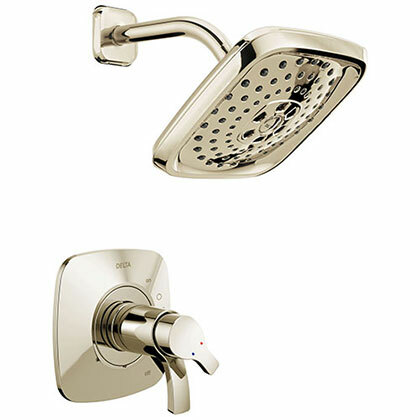 The 17 Series shower cartridge keeps water within +/- 3.6 degrees whereas the 17T keeps it within +/- 3 degrees. It may look like a small difference but this is actually a 20% improvement! If you have ever been in a house with older plumbing you are likely familiar with the problem of how if someone flushes a toilet or turns on the water in one part of the house, the water temperature in another part can suddenly drop. If you are the one in the shower at this time you might experience a burst of cold water. Or worse, a burst of scalding hot water. This is one reason that keeping the temperature in a strict range is important. 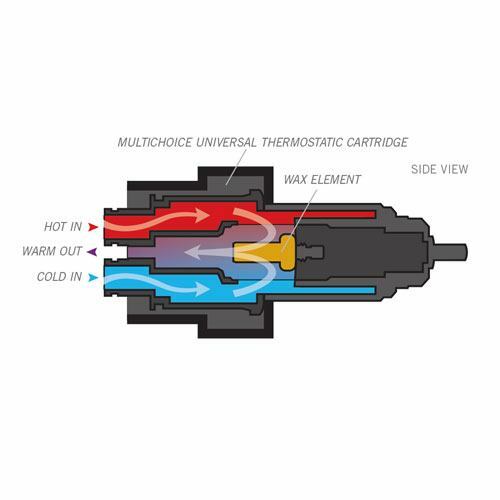 While both the 17 Series and 17T Series cartridges have this ability, that extra 20% in temperature accuracy might matter to you! To be clear, both the 17 and 17T cartridges designed to keep the temperature of the water in a safe range. 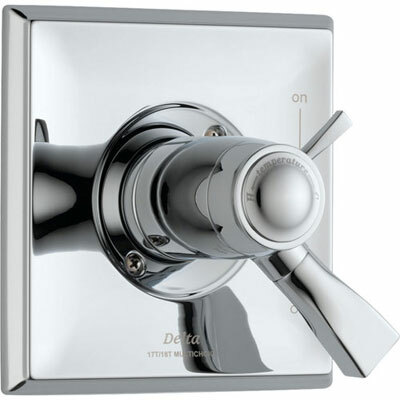 You will not actually get hurt by a water temperature change if you are using any new Delta shower as they all comply with federal anti-scald guidelines. Whether you have the 17 or 17T really just determines whether the water may get a little warmer or cooler depending on water usage in other areas of the house. Both are 100% safe. 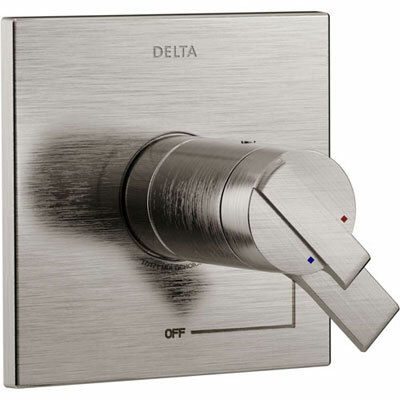 All Delta showers feature a temperature limit stop. 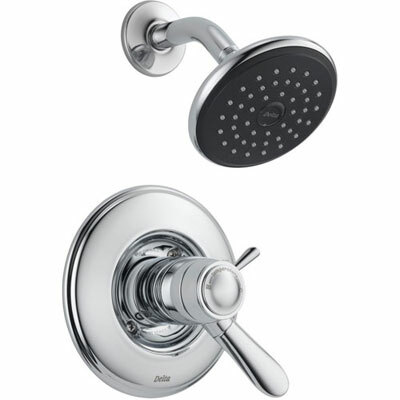 This allows you to pre-set a maximum shower temperature to prevent scalding. This is another area the 17T clearly outperforms the 17. The video below explains how the limit stop is set in both 17 and 17T Series tub / showers. Basically the process involves taking off the temperature handle and adjusting the maximum temperature limit. If your water is too cold even when the temperature dial is maxed out, you may need to adjust the limit stop to warm it up. Similarly, if the temperature of water is too hot, you can adjust it down. As noted in the video, most hot water heaters are set to 120-degrees so if the overall water temperature is too high or too low, you may need to start there. So if both have a temperature limit stop, what is the difference? With the Monitor 17 Series cartridges it is a mechanical limit restricts how far you can rotate the lever. You set the water to as hot as you'd like it to be. Then you adjust a plastic dial as shown in the video. The dial limits the handle from being rotated beyond that setting. It essentially limits the maximum "hot water" to "cold water" mix ratio coming out of the valve. The scald setting on a 17T thermostatic shower valve cartridge actually limits the water temperature from rising above the specific temperature set by your limit stop. Turn up your water heater? The 17T cartridge doesn't care. It will still limit the water temperature to the maximum temperature it is set to. A Thermostatic 17T TempAssure cartridge controls the actual water temperature whereas a Monitor 17 Series cartridge controls the ratio of hot to cold water. Let's say you had a Shower with a 17 series cartridge. If you raised the max temp on your water heater and you forgot reset the temperature limit stop, you could end up with scalding hot water coming of your showerhead. If you decided to turn your water heater temperature down to conserve resources, you might only get lukewarm water out of the shower head until you reset the limit stop. 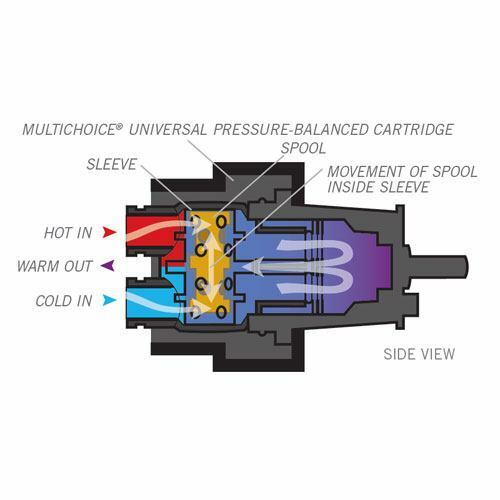 The 17 Series cartridge could periodically require an adjustment, especially if you live in an area where the seasonal temperature varies. If the ground water temperature changes you might need to adjust the water heater. This in turn may force you to also reset the temperature limit stop in your shower. It's not that it's hard, but it is definitely a bit of a hassle. The 17T series does a better job of actually sensing the temperature of the water. This means you won't need to adjust the temperature limit stop to account for seasonal differences in ground water temperature. It also means you won't have to adjust the limit stop if you make changes to the temperature of your water heater. 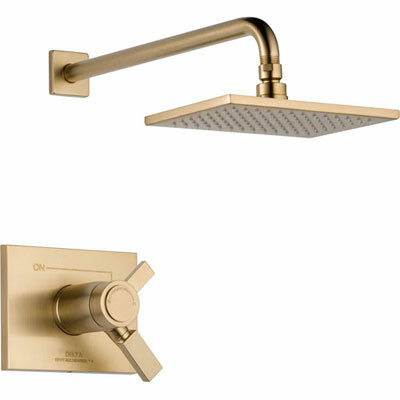 The 17T shower cartridge will simply detect the changes and adjust. The 17T TempAssure cartridge is designed to allow you to set it and forget it. Another advantage of the 17T Tempassure thermostatic shower cartridge is the flow rate. It offers a max flow rate of 8.53 GPM. This is compared to the monitor 17 series cartridge flow rate of 6.98 GPM. 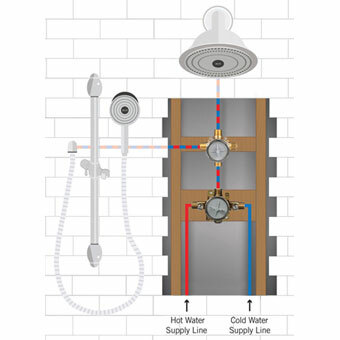 It may not seem like a huge difference but if you want a custom shower system with multiple spray heads, a hand shower, and a showerhead you will need that additional flow rate to ensure your system water pressure output is sufficient. 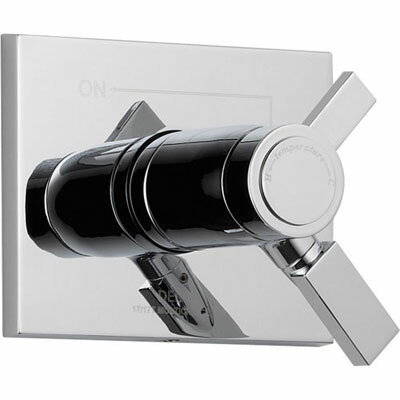 Even an Easy Install Shower System would benefit from a control with a 17T cartridge. The flow rate difference does not even explain the entire picture. Pressure-balanced showers have an inherent weakness to thermostatic shower faucets. Because they adjust temperature by maintaining a ratio between hot and cold water, when one drops, both drop. A scenario like a toilet flushing demands cold water from the system to refill the tank. This decreases the amount of cold water flowing into the shower. The 17 Series valve adjusts by decreasing the flow of hot water in the correct proportion. Well this is all fine with regards to temperature, but what about pressure? 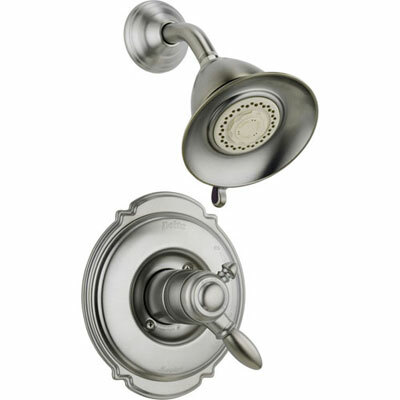 During this type of adjustment you may experience a drop in water pressure from the showerhead. 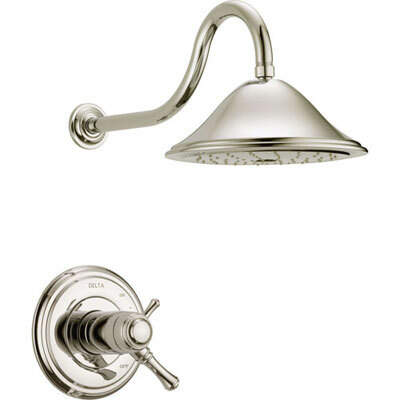 In the case of a single showerhead, this drop is not likely to cause a significant problem for you. But, if you are powering an entire shower system you would be better off with a 17T Thermostatic shower valve cartridge as it allows for the maximum flow rate at all times. If you are looking for a stronger showerhead spray with really high water pressure then a 17T shower is probably a better bet. When creating a full custom shower system it's important to make sure all the spray outlets will all have sufficient water pressure. 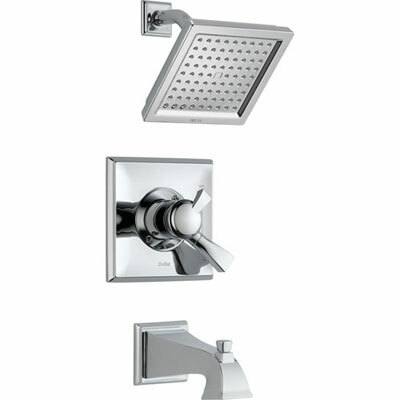 We have designed many pre-built shower systems with water pressure in mind. It's important not only to know the flow rate of each individual spray outlet, but to also know the overall water demand required by the system when everything is turned on. With 17 Series cartridges it's best to design your system with no more than 2 peripheral spray outlets. Usually body sprays are plumbed together and count as only one spray outlet group but pay attention to the flow rates! 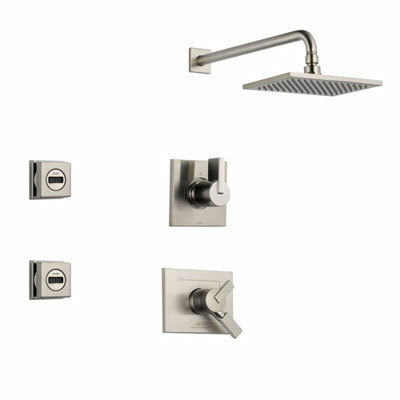 If you want a shower system with 3 spray outlets, we highly recommend you begin with a 17T thermostatic shower trim kit. To make sure the water pressure coming from each spray will be sufficient, you must start by ensuring you have selected a trim kit with the correct cartridge. In addition, due to the larger water requirements of a shower system, the benefits of a 17T cartridge are amplified. With a Monitor 17 Series if your cold water pressure drops the cartridge must compensate by dropping the hot water pressure. This would affect the overall water flow rate to all spray heads in your shower system. With a 17T cartridge thermostatic shower system you will have a more consistent water pressure which will make the experience more enjoyable. If you're shopping for a shower system you can make things easy and just order one of our pre-built systems. The water pressure of these systems is guaranteed to be acceptable. It's useful to understand the advantages a 17T TempAssure cartridge offers when designing custom thermostatic shower systems. It's possible you simply don't want a shower system with 3 spray outlets but you still want the benefits offered by a thermostatic shower cartridge. That is completely fine! 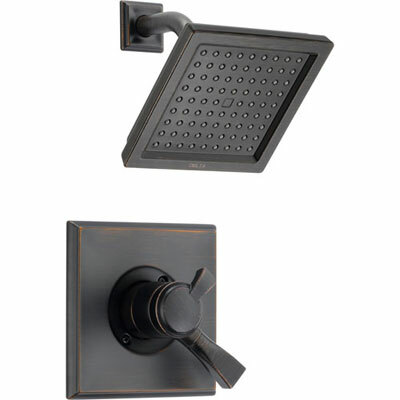 We have many customers who specifically want a shower system with just 2 spray outlets. The benefits of a 17T thermostatic shower cartridge still absolutely apply. With a thermostatic cartridge you get better water pressure, more stable water flow rates, and more precise temperature control. 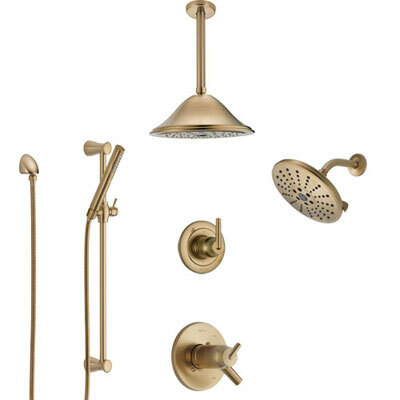 Although 17T thermostatic shower systems are a bit more expensive, the extra money will really improve your full body spa shower experience and might be worth considering. How's the water pressure in your home? Do you have great water pressure from all fixtures? Or are you on a well with lower water pressure? 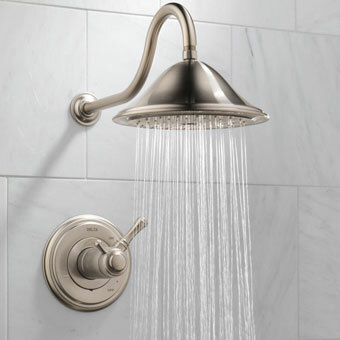 Water pressure from the showerhead is ultimately determined by the water pressure coming into your home. This can vary a lot from location to location. If your home has slightly weaker water flow and you want to get the highest water pressure possible from your showerhead, buy a 17T. If your house already has great water pressure save the money and order a 17 Series. 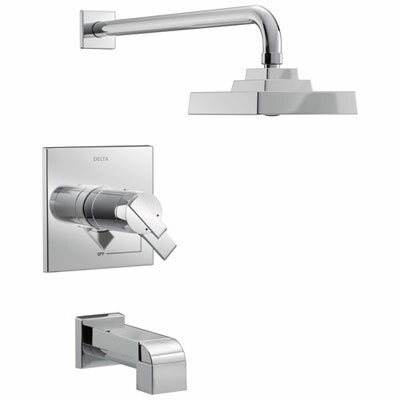 If you want to create a custom shower system with multiple spray outlets, we highly recommend using a shower faucet control with a 17T series trim kit. 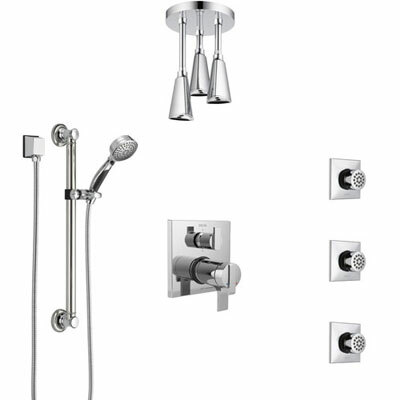 Make sure to check out our thermostatic shower systems. 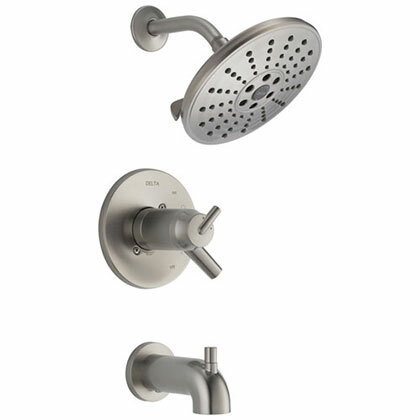 You really won't regret having that added water pressure when you are running multiple shower heads. Do you live in an area of the country with cold winters and warm summers? 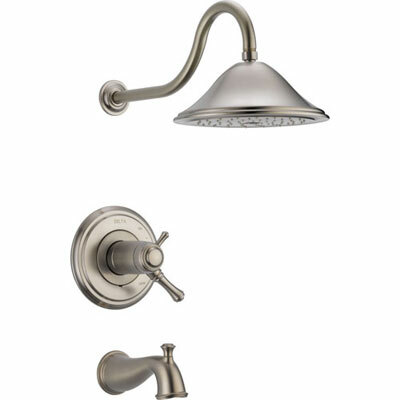 Avoid the hassle of adjusting your shower handle's temperature limit stop up and down as the seasons change. Get a 17T. If you live in an area where the temperature doesn't change much, you can save by going with a 17 Series. Do you have a house with older plumbing? Like the type where if someone flushes the toilet while you're in the shower the burst of cold water elicits screams? Go with a 17T. If your home is newer this is probably not going to be an issue and the 17 Series is fine. Do you often disagree with family members about the temperature of the shower? Although both 17 Series and 17T Series shower valve cartridges allow you to independently control the water pressure and temperature, the 17T Series is more accurate (remember, it's 20% better and doesn't fluctuate based on ground water). If you are constantly in a battle adjusting the temperature dial up and down, you will find that a 17T dial to be more predictable with regards to exactly how much the water temp will change for a given rotation of the control. The 17 Series will eventually get you to the temperature you prefer but you might need to fiddle with it a bit more. Although functionally better, the 17T series cartridge is also more expensive to produce. Therefore, it's price tag is also higher. While the 17T may indeed be superior technology, some of the functionality is unnecessary in certain parts of the country or in certain use cases. Especially if the advantages don't seem particularly applicable, this may be an area to save budget to use for other aspects of your project. 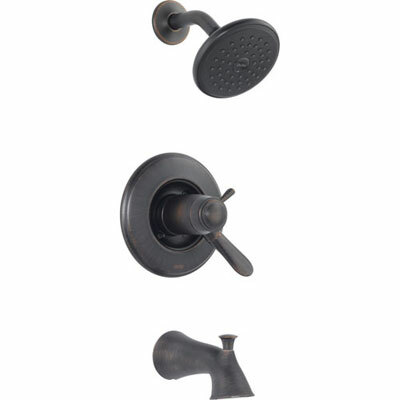 Both Delta Monitor 17 Series and 17T TempAssure Series shower valve trim kits come in many great traditional and modern styles, feature beautiful finishes, have a lifetime Delta warranty, and include dual temp and pressure shower handle controls. But there are some pretty nice advantages to the Tempassure 17T series trim kits. These advantages don't apply in all situations and 17T fixtures also come with a higher price tag. It's important to weigh whether or not the advantages of the 17T series cartridge will be beneficial for your specific use case, especially given the extra cost. Remember, a shower is not something you change often so put some careful thought into your choice. With the 17T true thermostatic shower you get stricter water temperature control. You will never have to adjust your temperature limit stop. You will get better water pressure from your showerhead. All for a small increase in price. 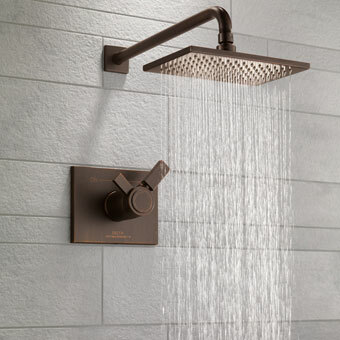 Especially if you want a full body custom shower in your master bathroom, you should really consider a thermostatic shower system. 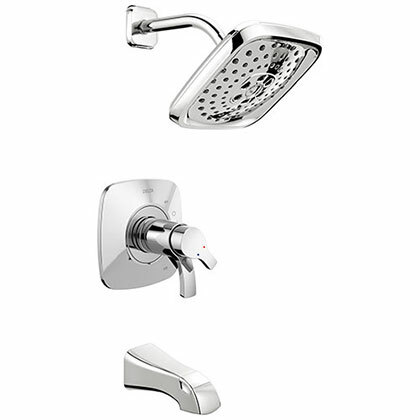 With multiple shower head systems the benefits of the 17T cartridge are even more pronounced. 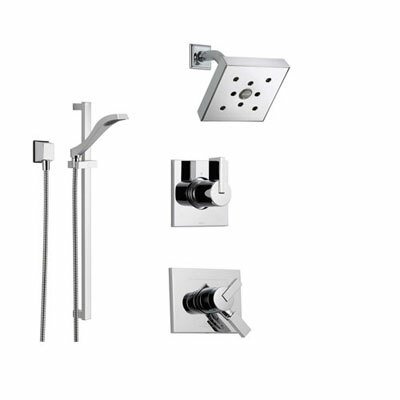 We have sold thousands of 17 Series shower trims and 17T Series shower trims and have found that most customers are very happy regardless of which they choose. Delta is an industry leader for a reason. Basically nothing they make is bad so we can confidently recommend either. 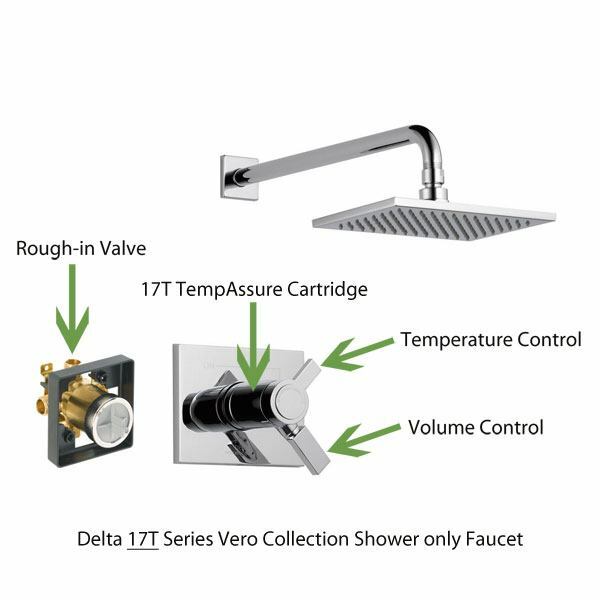 Hopefully this guide helped explain everything you ever wanted to know about Delta 17 and 17T Series shower cartridges but if we missed something, please feel free to ask us in the comment section below. 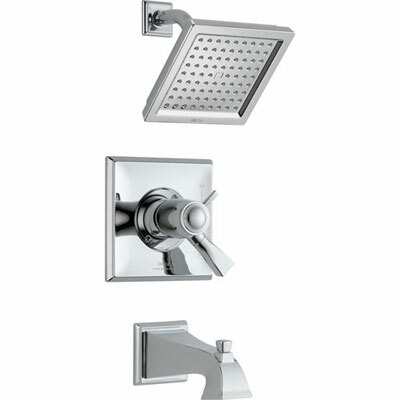 You can also read more about Delta in our Complete Guide to Delta Shower Faucets. We have over 40 years' experience in the plumbing industry and have come across most situations so feel free to Contact us if you need any help! If you found this guide helpful please "like" us on Facebook. We are pretty new to the whole social media thing and would appreciate your support! Hi Mike, thanks for the comment! With regards to your question, the 17 and 17T will function the same. Even if you leave the temperature dial on “warm” there will still be a lag between when the water actually starts spraying out as warm. The reason is, the water inside the pipe (between your shower and your hot water heater) cools off when not in use. The water is heating in the water heater but does not stay warm in the pipe itself. The time it takes for the water to heat up depends on how far your water heater is located from your shower. The way larger buildings and hotels get “instant” hot water, is they usually have a boiler which is constantly circulating water through the pipes at all times. When you turn on the water, there is hot water immediately available. In a standard home installation, you probably won’t have water circulating so you’d still have to wait. 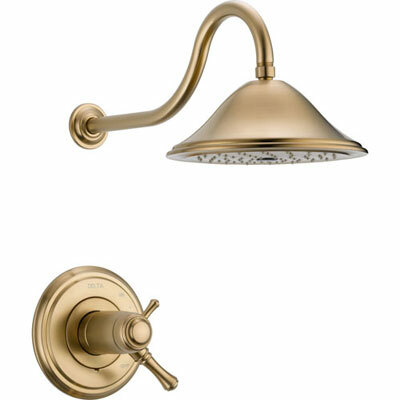 One idea is to research electronic shower water heaters to install in addition to your standard gas water heater. Typically these are marketed as tankless hot water heaters. They typically have a small reserve tank and are able to heat water quickly so as more is drawn in, it is heated immediately. This allows for an endless stream of hot water. It also means the hot water is readily available. Great write-up thanks. Follow-up question: Will there be a difference between 17 and 17T when I first turn on the shower and am waiting for the water to get hot? Let’s say I always want to leave the temperature knob on a “warm” setting. I understand when I turn on the 17, it will simply balance pressure from both hot and cold sides and eventually the hot side will actually be hot from the water heater. Will the 17T actually try to draw entirely from the hot pipe, until the hot water from the heater reaches the valve? (or will it still mix hot and cold sides) If the 17T does this, then it will actually get your shower ready faster and save water, if you are simply leaving the temperature knob at warm all the time. 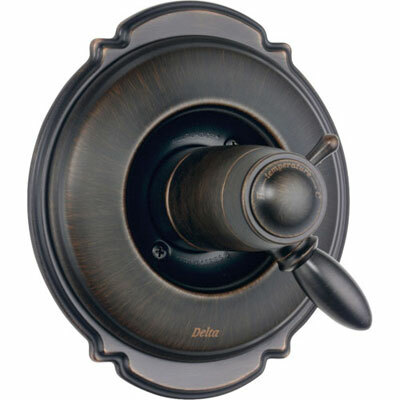 Hi Subhas, if you only need a cartridge replacement you can order one from Delta: https://www.deltafaucet.com/parts-product-detail?modelNumber=RP47201 It might be a good idea to search around a bit for delta item number “RP47201” to see if you can find another seller who has one listed for less. 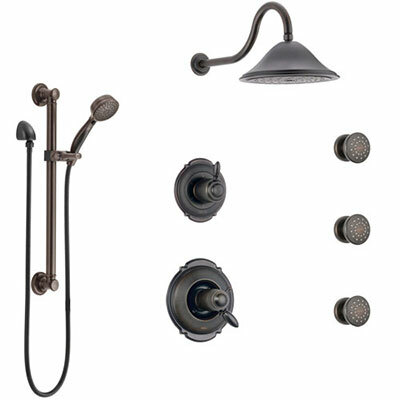 Keep in mind, if you have an older shower fixture the cartridge may be different so you would want to be sure this is what you need before buying one. For help with this, you should speak to Delta or a knowledgeable plumber. 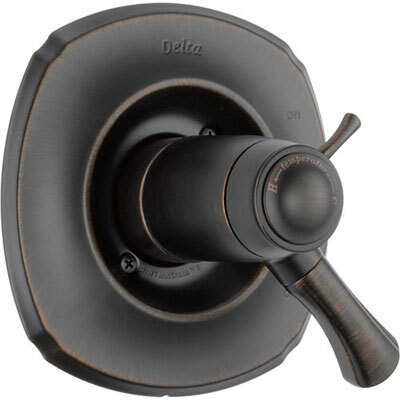 Additionally, I will mention that if you already have a Delta shower faucet and it is malfunctioning, the cartridge replacement may be covered for free under the product’s lifetime warranty. I recommend you give Delta call and see if they would replace it. Calling Delta is the best way to identify exactly what you need. Here’s their number: 1-800-345-DELTA (3358) Thanks! I need a Cartridge for Delta TempAssure® 17T Series. Where can I buy it? Hi John, the answer to your question is: sort of. Basically if you have a Delta 17 series trim kit you can replace it with a Delta 17T series trim kit. 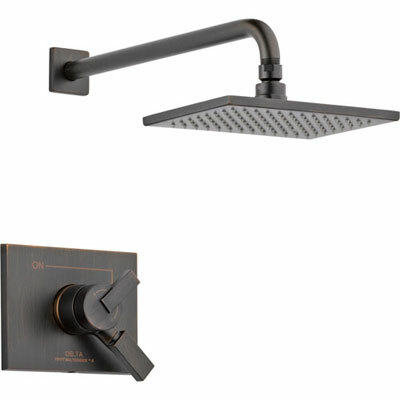 Both work with the same rough-in valve (the part in the wall). You won’t be able to simply swap out the cartridge. 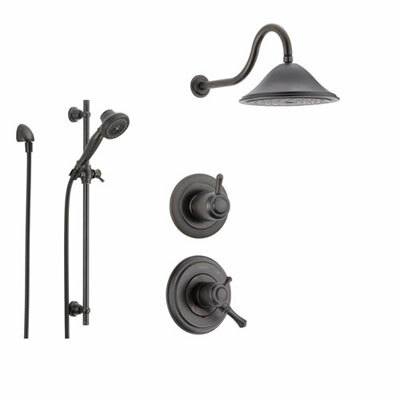 You will need to switch the entire trim kit but this is a lot easier than a full shower remodel where you would also have to change the valve. Another thing to note is that you really don’t even need to change the entire trim kit. You would basically only need to change the control handle part. 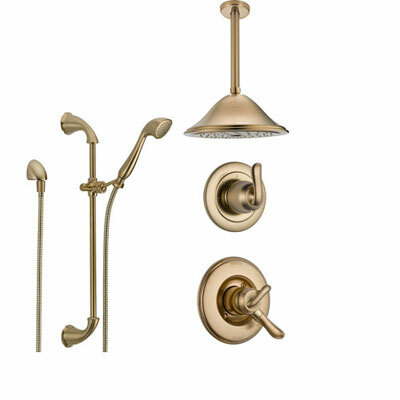 You could leave the showerhead and arm in place. 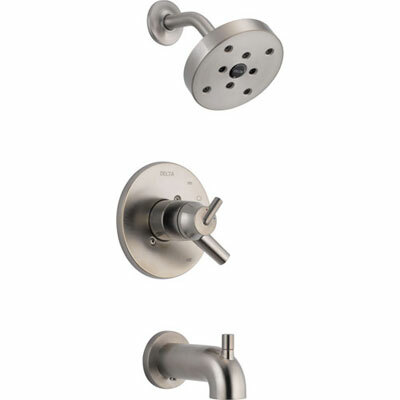 So let’s say you had this item: https://faucetlist.com/collections/shower-faucet-control-handle-only/products/delta-cassidy-2-handle-chrome-temp-volume-shower-valve-control-trim-582228 (a 17 series control trim), you could replace it with this item: https://faucetlist.com/products/delta-cassidy-chrome-thermostatic-shower-valve-dual-control-trim-kit-582232 (a 17T series control trim). If you compare the items side by side you will see that the handle area is slightly different. This is because the 17 and 17T series cartridge are different lengths. This is why you can’t switch the cartridge ONLY. But if you are willing to switch the control trim kit, you will be able to make the change from 17 to 17T. Hope this makes sense! can I replace a 17 cartridge with a 17T? Whether you are building a new home or remodeling an existing bathroom, a Delta Shower System with Hand Shower will help you create the shower of your dreams! 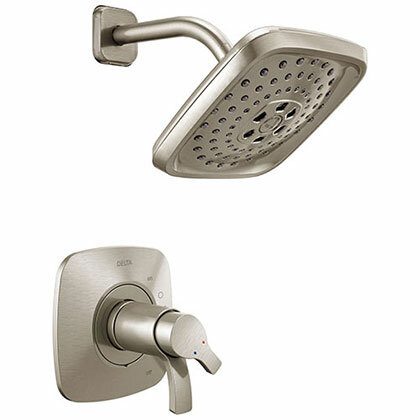 Why choose a normal Delta shower faucet with a single showerhead when you can make your shower experience more enjoyable and add tons of functionality with the addition of a handheld sprayer? 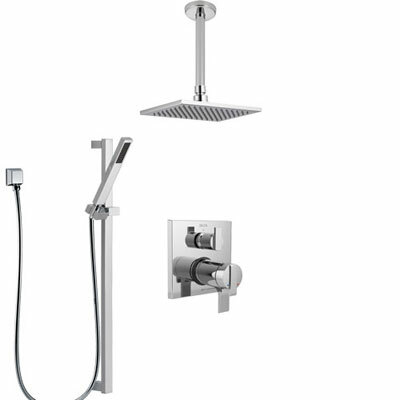 Learn How to plan and Install a Delta Shower System with Hand Shower!